Initial 2D evaluation of the aortic valve involves describing the type of valve that is present. Aortic valves typically have 3 cusps (right, left, and non-coronary), however, unicuspid, bicuspid, and quadricuspid valves can occur. 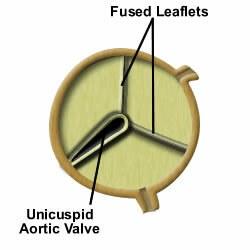 Unicuspid aortic valves usually have incomplete fusion of all of the leaflets and exhibit aortic stenosis. Quadricuspid aortic valves have 4 cusps where a single original cusp has split or failed to fuse in utero. Quadricuspid aortic valves are associated with aortic regurgitation. Bicuspid aortic valves can involve the fusion of the right and non-coronary cusps, right and left coronary cusps, and the non-coronary and left cusps. Bicuspid aortic valves are a congenital disease, however, heavily calcified or sclerosed aortic valves can present functionally as an acquired bicuspid aortic valve. Bicuspid aortic valves may be associated with ascending aortic dilation. The aortic valve leaflets can exhibit normal, excessive, restrictive, or a oscillating motion. Normal leaflet motion occurs when leaflets coaptation occurs at the aortic valve annular plane during diastole and each leaflet extends to become parallel with the the LVOT/Aorta plane during systole. Excessive leaflet motion is best recognized during diastole when a leaflet moves below the aortic valve annular plane during diastole. Restricted leaflet motion occurs when the leaflets cannot extend to become parallel to the aorta during systole. Leaflets may oscillate or appear to be "flapping" during systole. Oscillating leaflets indicate leaflets that are caught in a turbulent jet from subaortic stenosis or high velocity ejection of blood. Excessive leaflet motion is an indication of aortic regurgitation. Restrictive leaflet motion implies decreased cardiac output, aortic valve sclerosis or aortic valve stenosis. Aortic valve sclerosis is calcification of the aortic valve leaflets which may cause turbulence (and a murmur) but does not decrease the aortic valve area to the threshold of stenosis. Aortic valve sclerosis has been associated with an increased morbidity and mortality in the elderly.